You can view ad campaign reports after your ads start displaying. Study the statistics regularly to learn how effectively your ads attract customers and to find weak points in your ad campaign and fix them. To find out whether performance advertising is effective, it is not enough to just assess how much traffic it has brought to the site. You need to know whether you are gaining customers and revenue. What is most important is not the CTR, the CPC, or the ad display position, but metrics related to the conversion of clicks into real orders. In order for conversion metrics to be available in a report, you need to connect Yandex.Metrica. Engaged sessions metrics show how interested site users are in your products and services. This is calculated using machine learning algorithms. These metrics help you evaluate the effectiveness of advertising if you have connected Yandex.Metrica but have not set up goals. What they show. The Conversions metric represents the number of converted sessions that advertising brought to the site, Conversion rate (%) shows these sessions as a percentage of the total number of sessions, and Goal cost shows the average expenditure to obtain one converted session. How to configure the settings. To get conversion data in reports, set up goals for your advertising campaign in Yandex.Metrica — that is, the key actions that you want users to perform. For online stores — “Viewed 2 or more products”, “Added an item to the cart”, “Placed an order”. For a site offering services — “Viewed 3 or more pages”, “Visited the services catalog”, “Clicked ‘Call Me’”, “Submitted an online request”. If your main advertising objective is for purchases to be made on the site, enable e-commerce data collection to know the amount of each order. Note. If you know the approximate value of each conversion but do not submit them to Yandex.Metrica, you can estimate the revenue and ROI independently using data on the number of conversions in the report. Follow the View statistics link on the campaign page. To view statistics for all campaigns, go to the My campaigns page and click on Statistics for all campaigns. Specify the goal for which you want to find out conversions. Select “First click” to attribute conversions to the ads and keywords that initially brought a user to the site. This attribution model is appropriate for sites with deferred conversion where users take a long time to make purchasing decisions. Select “Last non-direct click”to attribute conversions to those ads and keywords that brought the user to the website before completing the goal (that is, there were no transitions from search and from other sites between clicking on the ad and conversion). Engaged sessions, Cost per engaged session, Engaged session rate (%) — if a Yandex.Metrica tag is installed. Conversion rate (%), Goal cost, Conversions — if, in addition, goals are set. ROI, Revenue — if, in addition, conversion values are transmitted when goals are completed. The number of conversions and how much revenue was produced by advertising. How much you spent for the period overall and on average per conversion. To investigate which factors affect ad conversion, add different cross sections to the report and see how the data for these cross sections differ. For example, by adding the cross section Formats, you may see that ads with video extensions bring more conversions and the price of these conversions is lower. In this case, you can get additional conversions by setting bid adjustments for displaying ads with video extensions. In this example, the CPA for ads with video extensions is 16.5 euros. If you are satisfied with a CPA of 50 euros, you can increase the rate for video extensions by 50 / 16.5 ≈ 3 times, that is, add 200%. Similarly, you can compare conversion costs and ROI by city, gender and age of users, and so on. Add the cross section Impression criteria to the report — it displays the keyword text. Sort the report rows by the Clicks column value. Study the statistics for the most popular keywords — for example, the 100 keywords with the most clicks. Note how many conversions and how much revenue each keyword brought, as well as the cost of these conversions. If the ROI or the cost of conversion for a keyword is below the optimal value, check the keyword using the Search queries report. In the search queries report, specify the same parameters as for analyzing the overall effectiveness of the campaign in the Report Wizard. Add goal and keywords filters. You will see real search queries entered by a user that match your keyword. Sort the report rows by the Clicks column value. This way you can identify non-relevant queries that don't lead to conversions. To exclude impressions for these queries, add this query to negative keywords for the campaign or ad group (you can do this directly on the report page), or add negative keywords to the keyword. If you manage your bids manually, increase the bid for high-yield keywords and decrease the bid for low-yield keywords. As follows from the VCG auction rules, the difference between conversion revenue and advertising expenses is at the maximum at this bid rate. α is a coefficient from 0 to 1 depending on the type of business. The median value of α is 0.8. Add an Ad ID/Banner № cross section to the report and compare the stats on the ads. As a rule, ads that advertise the same product and have a similar message meaning will have a similar conversion rate. Among these ads, it's sufficient to choose the one that is most clickable. This selection is done automatically if you place ads in one group: as soon as enough statistics have accumulated, the system will automatically identify the most clickable ad for each keyword and display it more often. For more information, see Ad experiments. To compare two pages that a user lands on when they click on an ad, create two ad groups with identical content and settings, with the exception of links in ads. Add a Groups cross section to the report and compare statistics by group. It does not make sense to analyze statistics by platform and manually disable impressions on ineffective platforms. The best approach is to use automatic strategies — Average CPA or Average ROI — or, if using other strategies, to specify these key goals in the campaign settings. The system automatically optimizes the bid in accordance with the conversion forecast: the less conversion traffic coming from an ad platform, the cheaper the clicks will be. In order to draw sound conclusions from statistics, a sufficient amount of data is needed. For example, if a report line contains one or two conversions, their price in the report may differ significantly from the true value, which is the one you would see if there were very many conversions. 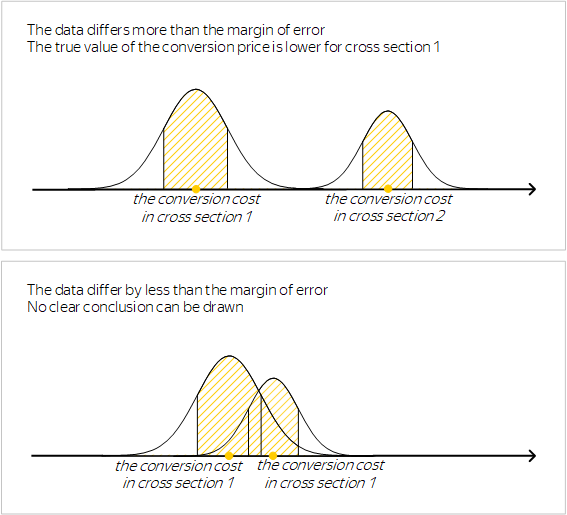 When comparing statistics for two cross sections, consider the statistical error – the possible deviation of the data obtained from the true value. If the data differ by less than the margin of error, it cannot be concluded that in one cross section the results were better than in the other. Reducing the margin of error by half requires four times as many conversions. To increase the number of conversions in the report, enter a longer period or choose a different goal. Here the coefficient is , where is the average conversion cost and is the standard deviation. In most cases, it can be assumed that . The table shows the relative error depending on the number of conversions.